The goal of the forcats package is to provide a suite of useful tools that solve common problems with factors. Factors are useful when you have categorical data, variables that have a fixed and known set of values, and when you want to display character vectors in non-alphabetical order. 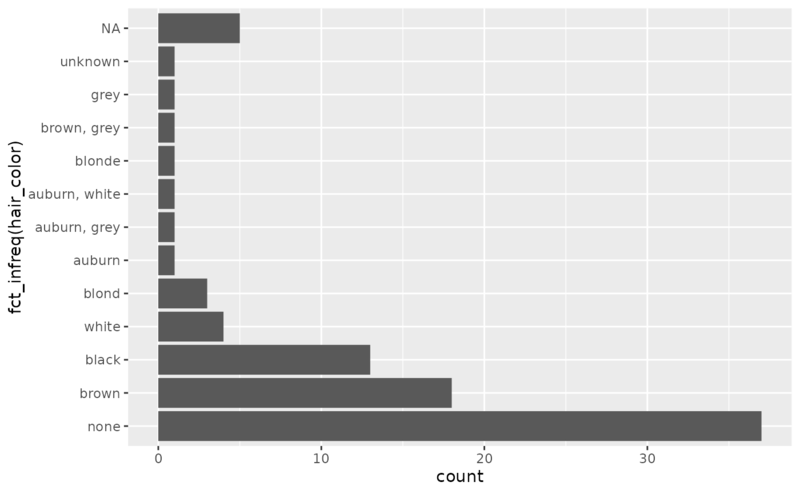 If you want to learn more, the best place to start is the chapter on factors in R for Data Science. Note that fct_infreq() it automatically puts NA at the top, even though that doesn’t have the smallest number of entries. We see that there’s 31 different skin colors - if we want to make a plot this would be way too many to display! Let’s reduce it to only be the top 5. We can use fct_lump() to “lump” all the infrequent colors into one factor, “other.” The argument n is the number of levels we want to keep. Only light and fair remain; everything else is other. 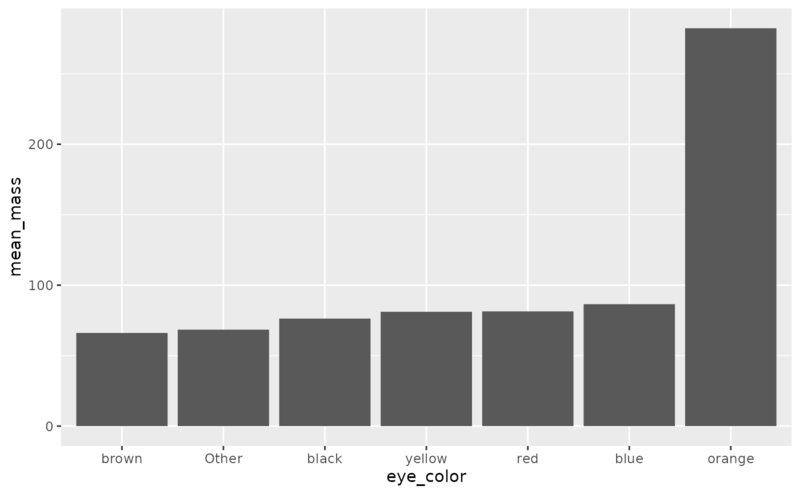 What if we wanted to see if the average mass differed by eye color? We’ll only look at the 6 most popular eye colors and remove NAs. It looks like people (or at least one person) with orange eyes are definitely heavier! If we wanted to make a graph, it would be nice if it was ordered by mean_mass. We can do this with fct_reorder(), which reorders one variable by another. 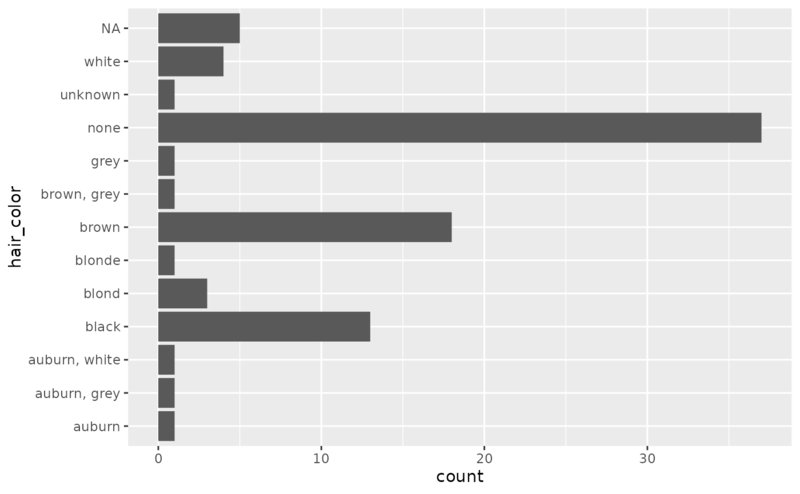 Let’s switch to using another dataset, gss_cat, the general social survey. What is the income distribution among the respondents? #>   "$1000 to 2999"  "Lt $1000"       "$4000 to 4999"  "$20000 - 24999"
#>   "No answer"      "$15000 - 19999" "$7000 to 7999"  "$25000 or more"
#>   "$5000 to 5999"  "$6000 to 6999"  "$3000 to 3999"  "$8000 to 9999"
#>  "$10000 - 14999" "Refused"        "Don't know"     "Not applicable"
Now if we plotted it, it would show in this order, which is all over the place! How can we fix this and put it in the right order? We can use the function fct_relevel() when we need to manually reorder our factor levels. In addition to the factor, you give it a character vector of level names, and specify where you want to move them. It defaults to moving them to the front, but you can move them after another level with the argument after. If you want to move it to the end, you set after equal to Inf. #>   "Lt $1000"       "$1000 to 2999"  "$4000 to 4999"  "$20000 - 24999"
What if we want to move them to the second and third place? #>   "$4000 to 4999"  "Lt $1000"       "$1000 to 2999"  "$20000 - 24999"